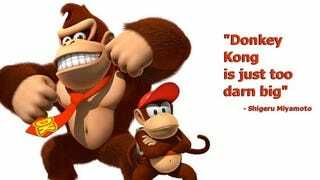 The creator of Mario and Donkey Kong explains why the plumber was better-suited to star in so many games than the ape. A win for the little guys out there. Donkey Kong Jr. was created to solve this problem, Miyamoto tells Time's Techland. Smaller heroes were better-suited to the 8-bit era of the Nintendo Entertainment System. But Mario caught on, so Mario became the icon, the hero of so many great games.